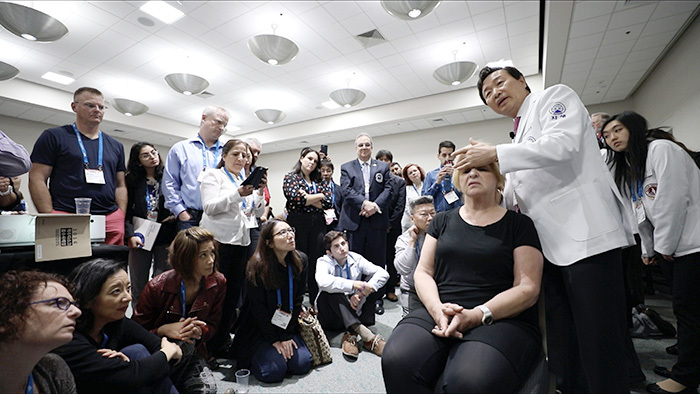 On October 6th, Dr. Joon-Shik Shin, honorary chairman of Jaseng Medical Foundation, was invited to give a lecture to U.S. healthcare professionals on non-invasive treatment methods of Korean Medicine at the Osteopathic Medical Education Conference (OMED) held in San Diego, CA. In 2012, Dr. Shin lectured at OMED for the first time as a Korean Medicine doctor. This lecture was held with the approval of the American Osteopathic Association (AOA) to recognize non-invasive treatment methods of Korean Medicine, such as Chuna therapy, as a Continuing Medical Education (CME) course. As a result, the occasionally-provided continuing medical education for U.S. healthcare professionals will be arranged regularly at Jaseng Hospital of Korean Medicine. Meanwhile, AOA’s OMED is the largest osteopathic medical event attended by more than 30,000 U.S. osteopathic doctors (DOs). In recent years, the DO-MD merger has been promoted in the U.S., meaning that the allopathic and osteopathic residency accreditation systems are merging to be one consistent system. This system, which will be completed by 2020, will ensure the expansion of different types of trainings available for MDs and DOs. The DO-MD accreditation and match merger has been promoted with the consensus that U.S. medical care should go beyond existing limitations, emphasizing patient-centered care. To this end, interest in scientifically-proven Complementary and Alternative Medicine (CAM), which can overcome the medical limitations of existing healthcare services, has naturally increased. Dr. Shin demonstrated the treatment of neck problems utilizing Chuna therapy, as well as the treatment of temporomandibular joint disorder and adhesive capsulitis using Motion Style Acupuncture Treatment (MSAT). As Chuna therapy is likely to be included in the Korean national healthcare insurance system in 2018, it is even more notable that Chuna therapy has been recognized and accepted in the U.S., one of the most medically advanced countries in the world. Although the non-invasive treatments of Korean Medicine were at first only introduced to DOs via an exchange program at Michigan State University (MSU) and Michigan Osteopathic Association (MOA), it has now been further promoted to various osteopathic professionals throughout the U.S. at OMED. This can be interpreted as the first step towards the advancement of Korean Medicine in the U.S. integrative healthcare system. At the same time, Jaseng Hospital of Korean Medicine secured its credibility a CME provider, recognized by AOA. Dr. Shin has constantly made an effort to collaborate with U.S. healthcare professionals and promote Korean Medicine in the U.S. He has been training U.S. DOs since 2012 and contributed to the appointment of Korean Medicine’s treatment modalities as a CME curriculum at MSU. In recognition of these achievements, Dr. Shin was deeply honored to receive the award of an honorary doctorate degree from MSU in 2017. The award of an honorary degree is the highest recognition that MSU can give to the world’s distinguished scholars. “Today, our exchange is a meaningful opportunity where the East and the West meet. We hope that our encounter will lead to the promotion of public health and medical development globally. Also, the exchange between Korean Medicine and Osteopathic Medicine will a stepping stone to improving patient-centered healthcare systems in both Korea and the U.S.,” says Dr. Shin. It is Jaseng’s hope to continue our efforts to promote the globalization of Korean Medicine, prioritizing patient-centered care.